NWR's staff gives their own thoughts on the latest entry in the storied Zelda franchise. We’ve gathered a group of NWR staffers to get their thoughts on the latest incarnation of Hyrule. In fact, we even have some thoughts on the much forgotten about Wii U version of the game! Scores have been consistently high for Breath of the Wild across various outlets; will it be the same for our panel? Bryan Rose, Reviews Editor: I fully admit to not being the biggest Zelda fan, but when I played Breath of the Wild at last year’s E3 I knew I had to give this entry in the series a shot. It finally felt like they had broken out of the Ocarina of Time mold and moved on to something completely new. Those feelings and thoughts were confirmed after playing the final build -- it’s truly one of the more memorable experiences I’ve had in playing a video game, and no other game feels complete since playing it. What I love about the game the most is that it truly gives you a sense of free will in an open world video game, with great leeway in what you want to do, when you want to do it and how you’re going to do it. I’ve played plenty of games with giant, sprawling open worlds like Grand Theft Auto V and others in the genre, but those worlds never felt as immersive and in depth as Breath of the Wild’s. Thirty hours into the game I was still finding new areas, shrines, items and enemies to collect and explore. Each time turning on the Switch felt like a new experience through exploring Hyrule, something I can’t say for a lot of video games. I wouldn’t call this the perfect game (I thought some of the shrines were annoying, framerate dips were present, etc. ), or my favorite video game of all time, but Breath of the Wild combines a powerfully told story with an amazing, immersive world that you can’t help but spend countless hours on. It's a true testament to Nintendo’s innate ability to constantly reinvent the franchise when the time is right. Much like the original game and Ocarina of Time before it, Zelda: Breath of the Wild’s immersive scope and quality will challenge other open world action games to try and top it for decades to come. I wish them the best, because this will be hard to beat. 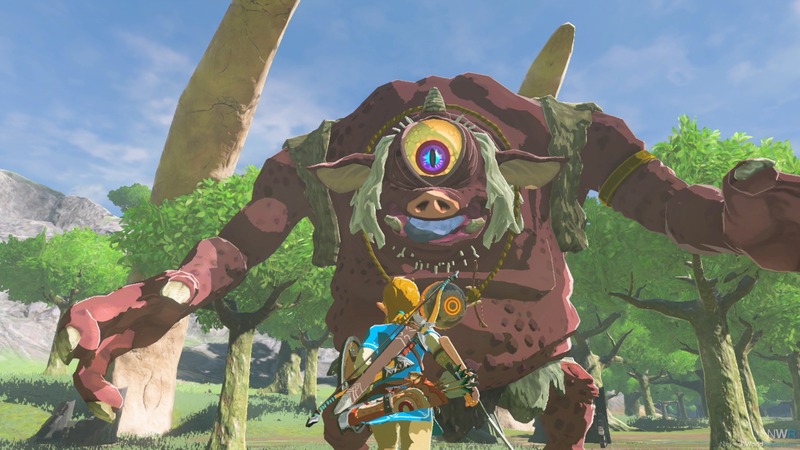 Andrew Brown, Associate Editor: After spending over a month with this game and still having many side quests to complete and items to find, it's safe to say that Breath of the Wild is monstrous. The sheer size of the land of Hyrule with its rolling hills, craggy valleys, vast deserts and frozen tundras is beyond the scope of anything Zelda fans have ever seen before, and there's such a greater emphasis on survival and adventure now in the reworked system of cooking, weapon and armor upgrades. Most importantly though, the title still feels like the Zelda we all know and love, just on a grander scale. Welcome additions to the classic recipe include multiple towns teeming with NPCs, all of them named individuals and no two with the same face or body shape. Giving players most of the key items and a fast-travel button right at the beginning opens up the game for creativity in exploration, while secret techniques and tactics to master keep the game turning at a progressive pace with few dull moments. Climbing on just about every structure in the game feels natural and allows for completely new puzzle twists to navigate the land. Amiibo functionality is surprisingly useful and quite fun for completionists hoping to collect all the secret costumes and gear. Other additions don't add as much as they hope to achieve in a series like Zelda. What little ambient music is present in the game is lovely, but the Hyrule overworld tune being a little more prominent wouldn't have gone astray. Voice acting also doesn't do much to add to the immersion though the talent is quite good subjectively, but my personal feelings lean away from Zelda's clichéd British accent (because it's a fantasy with castles, the princess MUST be British!) and long for a universal Hylian nonsense language spoken by the cast a-la Skyward Sword. There's also a slightly disappointing lack of enemy variety – where are the ReDeads, the Peahats, the Gibdos and particularly Like Likes that would have been a boon for clearing inventory of expendable shields? All said and done, the game is a masterpiece of an achievement and the pros outweigh the cons tenfold. I can't recommend this game enough to anyone who ever played a Zelda or even a Nintendo title. Casey Gibson, Associate Editor: It’s been an excruciatingly long wait for a new 3D Zelda, but it has been proven to be worth it. Breath of the Wild throws the conventional Zelda formula out the window in favor of a masterfully done open world adventure that redefines both the series and genre. As a person who usually feels overwhelmed with open world games, this prospect scared me. Fortunately, instead of littering you with hundreds of quests, Zelda instead promotes discovery through exploration. You are given all the tools you need to traverse the world within the onset of the game and are sent out into the world with little direction. The complete freedom Breath of the Wild offers is a totally unique experience, allowing you to tackle dungeons in any order, visit as many shrines as you’d like or even allowing you to make a mad dash for Ganon right off that bat (although this is ill-advised). I found myself lost in exploration for nearly 20 hours before even setting foot in a dungeon which came as a complete shock as I normally enjoy pushing the main quest line along. However the feeling of discovering new areas, hidden shrines or little villages off the beaten path was far too satisfying and fun to want to do anything else. This feeling never waned as I progressed through the enormous land of Hyrule, consistently discovering new and interesting things even as I approached the final battle. The game is not without fault, as frame rate dips are present, but little can take away from the master class that is Breath of the Wild. Andy Goegren, Managing Editor:Looking at Breath of the Wild as a Wii U swan song, a few things come to mind that would not be apparent for owners of the Switch version of the game. In most respects, it's hard to see this Zelda title as anything other than the landmark title that it is; a reboot of a historic franchise that takes what worked about the earliest Zelda titles and extrapolates to comically large degrees. Because the game was ported to Switch, however, there are a few nits I must pick with regards to how well the game fits onto the Wii U. First and foremost, the usage of the Wii U GamePad is sorely underwhelming. Earlier Zelda remakes on the platform made great use of the GamePad as a map and inventory screen, keeping the amount of time spent in sub menus to a bare minimum. For Breath of the Wild, the GamePad serves as nothing but an Off-TV play option. That's not nothing, but it's not much. Another Wii U specific complaint would be that the game plays wonderfully with the Wii U Pro Controller.... 99% of the time. On the occasions when the game forces you into a motion control mini game, you are required to swap back to the GamePad because the Wii U Pro Controller doesn't support motion control. This, of course, is not an issue on Switch because there is no control option that doesn't have motion sensing capabilities. In the end, wandering the landscape and looking for shrines is a compelling and rich experience regardless of the platform. At its core, this is a game about wandering around; I wandered for a good 65 hours. Eventually I reached a breaking point where I found the exploration less compelling, and took a bee-line to the endgame. I'll probably go back, but for now I'm happy to be finished. I'm not as overwhelmingly positive on this game as most of the critical reception would indicate I should be, but I can't argue that it's not revolutionary. I can't wait to see what lessons Nintendo takes from this game to the next. Zachary Miller, Associate Editor: I've never played a game even remotely like this. Oh, I've played open world games before, of course, but none of them come close to the experience I get with Breath of the Wild. The map is ridiculously huge, and enormous swaths of it don't have anything particularly interesting going on in them, but that's what I love the most about it. If Nintendo set out to create a "living" world that stands apart from the immediate concerns of the plot, they've done so in spectacular fashion. Never before have I straight-up ignored the story in a Zelda game (or any open world game) to focus almost exclusively on effing around. It's the little things that impress me the most: birds flying overhead in V-formation, climate-specific wildlife, the overwhelming dread upon encountering your first mobile Guardian. I'm approaching this game's story missions almost as an afterthought. I stumbled across Rito Village and figured that I may as well get that Divine Beast over with. After that, I was back to seeing what's over there. Being able to climb almost any surface (max out your Stamina, kids) is such an incredible feeling. Almost without exception, if you see it, you can go there. In fact, that's what Breath of the Wild is for me: "what's over there?" The sense of discovery is so powerful, so important to the experience, that whenever the "video game" aspects show up, I'm genuinely annoyed. When I'm gazing in awe at a gigantic dragon floating through the sky and suddenly attacked by Lizalfos or Bokoblin skeletons, a twinge of anger crosses my brow. When a bunch of Koroks encouraged me to complete a bunch of trials so I could reclaim the Master Sword, I actually left the area and haven't been back because I'd much rather explore a little more even if it's aimless. The Shrines are generally great, though. I've only been irritated by a couple of them but for the most part, these bite-sized puzzle rooms are glorious and I continue to be impressed by the inventive puzzles they throw at me. Are there things I don't like? Sure, but none of them mar the experience and aren't worth going into here. I don't hold Breath of the Wild up on the same pedestal that I put Wind Waker on. Wind Waker is a tighter game but elicits the same kind of giddy exploratory vibe that its descendant does. But Breath of the Wild is close. It's weird to say that the game both does and does not feel like a Zelda game. Your weapons, shields, and bows break with repeated use. You're constantly scavenging supplies, changing your armor set, and cooking things. Skyward Sword toyed with these concepts but Breath of the Wild makes them core tenants. You have access to horses but they're certainly not necessary or really even encouraged. Traditional Zelda things like musical instruments and progress-enabling items found in giant dungeons do not appear. There are only a few enemy types. Almost none of the music evokes familiar Zelda melodies (although I smiled in the Rito Village). Any specific links to the Zelda "timeline" are vague and open to interpretation. At the same time, the presence of the usual Hyrulian races--Rito, Gorons, Zora, and Gerudo--ground the experience. Despite being nothing like a Zelda game, Breath of the Wild is unmistakably a Zelda game. Every time I boot this game up, I see something new and amazing. I cook something unique. I approach a fight in a different way. I gaze in wonder at the world I'm exploring and don't for one second want to see the journey end. Good to see some different opinions about the game. I think I would give it a 9 too. By "give it a 9 too," do you mean "Ocarina of Time is the only 10 in existence?" No, I dont even like OoT that much. BotW is definitely the best Zelda game. As good as it is, there were a few things that bugged me about it, like the weapons breaking so easily. I didn't mind the weapon durability too much, but it would have been nice if successful fury attacks and other critical hits caused less damage to your weapon than a normal attack, to encourage people to "fight better" and make weapons last. Hack hack hack. Sorry - what was that? Hack slash hack. Couldn't hear you over my button mashing. Ha! I've been staying away from the BotW threads because I plan on eventually playing the game. I was curious about the weapon degradation complaints since it never bothered me in games I've played that had them. Now I know why: my fallback strategy of first convenience is usually button mashing with an over-leveled characters. I mostly button mash and don't have too much of an issue with the degradation. If anything, I have an issue using all my good weapons, as the space is super limited. But all weapons are good. The Calamity Ganon commands it.